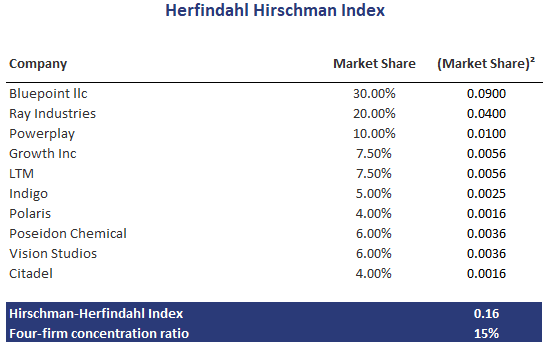 The Herfindahl Hirschman index or HHI index is an important measure of market concentration. It is a competitiveness measure that is used extensively to assess the amount of market concentration in a particular market. The measure was introduced by Albert Hirschman and Orris Herfindahl, although it is sometimes referred to simply as the Herfindahl index or H index. 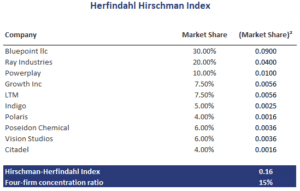 On this page, we discuss the Herfindahl Hirschman index formula, illustrate how to calculate and interpret the herfindahl index, and finally provide a Herfindahl index calculator as well as a four firm concentration ratio calculator in Excel at the bottom of this page. The HHI index is calculated as the sum of the squares of the market shares of the largest firms in the market. The measure ranges from 0 to 1. Sometimes, however, whole percentages are used in the calculation, in which case the index ranges from 0 to 10,000 points. Next, let’s turn to HHI calculation by applying the formula to an Herfindahl Hirschman index example. There are a number of important limitations to the HHI index. First, the HHI index does not consider barriers to entry. It could be that a market is highly concentrated, but entry barriers are low. In that case, market power may be very limited. Second, we have to choose the ‘largest companies’. This means that different researchers may come up with different HHI values for the same market.